It was clear in the fall-out from the reduction in the numbers of students gaining university entrance in the recent round of NCEA results that the changes to the rules were driven by several principles that are of themselves quite worthy. The first is that students should study a narrower range of subjects in order to know more. Or put another way, knowledge is gained vertically rather than horizontally. It is clear that the universities have believed this right from the very introduction of a standards-based assessment system when the move towards credits was described as the process by which knowledge had been turned into intellectual finger food! That was not entirely true but there may have been a whiff of truth in it. Certainly depth of knowledge was thought to be in danger when students were given the opportunity to study subjects that are outside of the standard academic canon. The second principle is that there should be a set of approved subjects that would be acceptable in making up the university entrance qualification. The existence of such an academic canon was the result of hundreds of years of development of universities as places of privilege and so certain subjects were also privileged. Such a list of privileged subjects was promulgated by the University Grants Committee and indeed even School Certificate maintained that privilege by on the one hand pretending to be norm-referenced while on the other using a procedure called “group mean referencing” whereby subjects undertaken by “brighter” students were scaled to a produce a higher set of results. Now the education system has, some time ago, debated what real subjects were. “Twilight Golf” never made the cut, meditation had no observable actions that could be assessed, and language CDs handed out in cafes were thought to have had too few demands on the students. No complaint about all that. But the firm grip that such views have enjoyed has seen a distortion on what was valued in terms of pathways to an education and to later success. Gradually only the track to university was valued in the school system and the capability and capacity of schools to provide programmes in areas that would grab the attention of young students was allowed to atrophy. The bog standard “academic” diet was going to nourish all the students. When now there is a call for students to have the opportunity to study subjects based on applied learning and to specialize in technical areas that require skill and knowledge in greater depth in order to pursue fulfilling and useful lives in the community, that the argument is put forward that what students need is a broad and general education. The MIT Centre for Studies in Multiple Pathways in partnership with Ako Aotearoa has just finished its fourth annual National Symposium in Wellington. Over 200 educators gathered to continue their journey along Te Ara Whakamana, considering possible pathways, transitions and bridges from secondary education into tertiary education. Flashback to Manukau Institute of Technology (MIT) in 2011 when the first gathering was held at MIT and 120 people got together to ask tentative questions related to the “new” policy setting of the “Youth Guarantee”, the approach to the new proposals for a more orderly view of NCEA credit that the Industry Training Federation had developed and called “Vocational Pathways”. The first secondary / tertiary programme in New Zealand, the MIT Tertiary High School, was up and running into its second year, and various academy programmes had started up. MIT has established the Centre for Studies in Multiple Pathways to be a centre of excellence for discussion, development and advocacy of the ideas that would allow students to find new and different ways of moving seamlessly through secondary and on into tertiary education and training. In particular, the initiatives were aimed at addressing the dysfunctional approaches to senior secondary schooling that saw too many students fail to achieve educational outcomes of which we could be proud and, to not put too fine a point on it, which were acceptable to a high-performing economy. And this in addition to the numbers of students that were dropping out of school prior to approaching the threshold for secondary education. So the 2014 Symposium was a very different affair. Policy is in place, there was very little discussion and grizzling (as there had been back in 2011) about funding other than its lack of flexibility and reports were made on a wide range of successful new ways of working that were bringing success to some of those who had previously failed or perhaps more correctly, been failed. It is possible to do something about what seem to be intractable problems. They took the dirty statistic of NEETs in Canterbury and by elimination reduced the numbers to produce a list of names. “From numbers to names to action” has been a call for action by Minister Hekia Parata for some time. The Key benefit of such an approach is that it gets the scale of an issue out into the light and able to be tackled. They showed that you manage transitions by doing something about them. Organizing the employment sector (manufacturing in this case) was a first step and then connecting that sector to those coming out of training programmes plugged the gaps. There is a high level of connected activity, one party addresses the issue of another party by adjusting the way they work. It is collaboration in practice. An idea that intrigued was the development of a Destinations passport that gave students a mechanism for systematically noting the ways in which they had developed the so-called soft skills that employers sought. No need to wait for schools to act, allow the students to use their real lives! There is a strong focus on evidence-based activity. Trevor McIntyre leads much of this work and he issued a challenge to those present. What is your earthquake? Certainly there are many things that need a good shake up. Steve Jobs always claimed that “the journey is the reward.” There is a group of educators in New Zealand that grows larger steadily that is on a journey to a place where students have access to equitable outcomes. 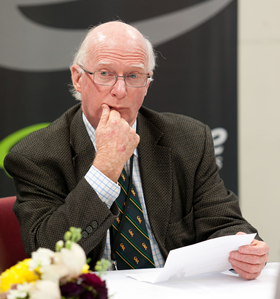 Dr. Peter Coolbear, director of Ako Aotearoa, invited the symposium to consider the impact of the changes that were being discussed. In the four years since the symposium started, 14,000 students have engaged in a pathway that is different from a conventional track through the conventional school. I noted, in bringing the deliberations to a close, that a wide-spread adoption of a “multiple pathways” approach (“linked learning” it is being called in the US) could well be the means by which we address the issues of the bipolar education system and see equity matching achievement in our school system’s performance. Just back from Australia and it is interesting how such a visit brings perspective to issues and topics of interest. I have been feeling for some time now that things are about to change, especially in the Anglo-Saxon countries which for 50 years have by and large got a lot wrong in education. · the need for reconsideration of current sector organization models of the education systems which are increasingly seen as a troubling block to lifting achievement. Each of the Anglo-Saxon educations systems is now seeing an increase in the numbers of students gaining earlier access to career and technical education. The pathways schools in Canada, the university technical colleges in the UK, many academy / charter schools in the USA, initiatives in Australia and, of course, the youth guarantee stable of secondary/tertiary programmes in New Zealand are each examples of how the integration of sound and continuing academic preparation can not only be combined with but is in fact enhanced by a closer focus on postsecondary qualifications in career and technical areas at a younger age. The Anglo-Saxons simply have to come clean – the experiment of comprehensive high schools proved to be neither comprehensive nor very successful. The result was a set of educational and employment outcomes that were inferior to those achieved by the schools they replaced. I think I want to reject the view that the development of the comprehensive high schools were essentially based on snobbery – Germany had a dual system of both academic and technical tracks, we beat them in the war, so the American Dream was born – college for all, equity of access to top universities and so on. Well it never happened. Schools lost their variety, pathways disappeared and the so-called academic university-bound track became dominant. Good for those it suited and always had, disastrous for the rest. But it is not simply a return to what used to be offered to students in a diverse set of schooling options – academic, general, technical, commercial and other tracks which defined outcomes at the outset of secondary education. The new and refreshed approach is one of multiple pathways that are both academic and vocational, which have flexibility, which provide a clear direction with different people delivering programmes in different places and with multiple purposes for learning. So talking the old industrial arts facilities and programmes and organisation out of mothballs won’t be sufficient. This development in no way undervalues the university-bound pathway – this pathway is also both academic and vocational for many. There is though likely to be a competition for resources as the performance of the education system encourages funders to see that a more equitable spread of funding is a good and necessary investment. This emerged a little in Australia last week. In working to “real identifiable work” the schools will be required to find a new level of flexibility. “Our kids need to know trades and training are first class career options just like university – they shouldn’t be made to feel like they’re playing on the ‘B Team’ “ says Aussie Federal Asst Minister for Education Sussan Ley. She also sees the need for schools to be more flexible in programme delivery allowing for “real work experience” – the challenge as to what constitutes “being at school” and the “school day” are in the wings and yet to come. That leads to the third issue – the challenges to the sector organization of schooling. The Catholic education system in Australia is getting ready to shift Year 7 (the equivalent of our Year 8) up to secondary schools in order to provide for a transition that comes at a better spot in the students’ pathway, allowing for a more coherent “junior” high school and therefore opening the way for increased flexibility in the “senior” secondary school. It is still my view that New Zealand should be seriously discussing the benefits and issues of placing the senior high school (i.e. Years 11-13) into the tertiary sector – now there’s a big topic. Such a shift would allow New Zealand to consider the features of education systems that we admire and give to them a New Zealand flavor. Are the times a’changin’? If they are then lets hope for more than hugs and bean bags this time round. There might be more than meets the eye! Then dark clouds rolled in – we had a skills shortage, we had a mismatch between the labour market and the supply line from education providers. We had a growing sense of unease at the indicators that pointed to something of a perfect storm where Salt’s demographic faultline rumbled at the same time as the GFC (i.e. a recession for those not into TLAs) took hold. There then developed a set of sideshows that risked turning education into something akin to a vaudeville show. Student / teacher ratios led the charge, then there was Novopay, then there was push back in Christchurch at offers of support to look at working in other ways that some other parts of the country might have welcomed (without, of course, the earthquakes that provoked them). Meanwhile, without a fuss, the world had started to change. New programmes appeared that were more closely aligned to employment. Students started to move into these programmes at a younger age. No longer was a 15-19 year old faced with a single choice – stay in school – but was able to consider pathways through different kinds of institutions and face having not just what used to be thought of as a school leaving qualification (NCEA) but with a set of qualifications, NCEA and a technical qualification, employment ready at about the time the rest were heading off to university to start the journey. In short, we are at a time when the education scene is changing for 15 – 19 year olds and the conventional senior secondary school is slowly being moved sideways to take its place alongside other pathways. Some of the developments are highly visible (the Tertiary High school, Youth Guarantee fees free places) while others are less obvious retaining a little of the look of school (trades academies for instance). I am told that by 2015, there will be about 17,500 young people (15-19 year olds) who will be pursuing their education in a place other than a school – ITPs, wananga, PTEs would account for most of them I imagine. This is something of a silent revolution. Imagine the size of a group of 17,000 students would look like in the one place! It is quite a few empty classrooms. That this is happening is not an argument against schools, it is simply affirmation that some young people have their life chances enhanced by continuing their schooling somethere other than a school. Don’t you love the US habit of referring to “school” for pretty well all levels? One fellow said to me recently I am going back to school next semester – that was to Harvard to do a Masters degree! So imagine my surprise when on Labour Day (consider the irony of this) I heard two news reports on the radio both urging the authorities to see that education institutions be measured by their success in getting people into employment. And they both were teacher organisations, one here in New Zealand and the other in Australia. We have just had the Ministry of Business, Innovation and Employment issue a RFP calling for proposals that bring together community connection and involvement, quality trades training, involvement of ITOs in the process of moving the student through to employment, the provision of tools – this all sounds like a commitment to seamlessness, it sounds like a carefully constructed pathway. And it is interesting that the TEC and MBIE are involved with each contributing what they do best. Is there enough happening to claim that a paradigm shift is under way? Possibly, the signs are there that we are moving away from a set of practices that have been fairly constant for thirty years. Next will come the uncertainty and then the emergence of a new way of working. But let me put this forward as an idea. Education was pretty constant in the way it worked for a hundred years until the late 1960s and 1970s when much change happened. Tracking / streaming was bad – out it went. Industrial arts were a reflection of an age now gone – out they went. The government employed 80% of the apprentices but they sold off the industrial and service agencies that employed them – out they went. Polytechnics were invented and training shifted both in the institutions and into daylight – out went learning on the job. It could be that the big paradigm shift really started back then, went through a time of great uncertainty (the 1990s and the 2000s) and what is happening now is the emergence of a new way of working. Now that would be exciting. There’s no “moocing” about here! I have become a student again. Yes, I am now a student of the University of Edinburgh. This would have brought great pleasure to my Scots grandmother I am sure. Yes, I have started my first MOOC (Massive Open Online Course). It is called “Philosophy for Everybody”, lasts for seven weeks, will require me to study for 1-2 hours a week and has a book that goes with the course. How did this come about? Well I had, some time ago, wandered through the various web sites of the major providers – Coursera, NovoEd and so on – and must have left my email address somewhere that indicated I would be interested. They got in touch recently with a range of courses that I might be interested in. Easy, minimum fuss from my point of view, getting back to me impressed me – all behaviours that face-to-face providers might strive to copy. I needed something that would not have time demands that were too heavy, that was focussed, had good, helpful resources and related to my interests and past learning. This fitted the bill nicely. At 1-2 hours a week I could see myself managing this. The trouble with so much conventional learning is that it is dolloped out in such large chunks, like the ladles of mashed potato thrown onto your plate in the army mess-hall. I wanted finger food. The focus was clear and the explanations of it attractive – a short introduction to some of the current approaches to philosophy, thinking and ideas. The resources were clear – seven staff members at the University of Edinburgh each wrote a chapter related to their unit in the course, they were put together into a book and that was it. I got mine from Amazon and put it into my Kindle – I have the resources for the course with me in convenient form. I am interested in philosophy having undertaken Philosophy 1 in my BA degree many years ago. That course was strong on logic (Students sit in lecture halls. This is a lecture hall. Therefore I must be a student) and some selected philosophers – Bergson and Plato I think. But the impressive thing to this point has been the total ease with which I have been enrolled -not only the ease, but also the style and approach. I was on first name terms with the University of Edinburgh and the philosophy team instantly. “Hello Stuart, Welcome to the University of Edinburgh.” I was enrolled, welcomed and knew what I needed to know in the space of the time it takes to search and make the thirteen clicks required by conventional tertiary websites. The course had actually been open for 12 hours when I got to it on Tuesday morning and already there were several hundred people logged on to the discussion room and they came from all over the world. It was like walking into a common room full of the buzz of friendly conversation with no-one staring. Immediately I was taken by the massive reach of this course geographically, across ages and experience. Being shy by nature I didn’t sign in – I shall do that this weekend. Now I know that it is easy to be enthusiastic at the beginning. A whopping 93% of those who start a MOOC are not there at the end. I am determined to be there. At that point, if I have “completed” the course (I know exactly what that entails and will require), I shall receive my “Certificate”. This will not be one that produces credit (you need to have your credit card handy when enrolling in those ones) but rather a simple acknowledgement of course participation and completion. That’s all I need at my stage. That might be all that a huge number of people are looking for. I suspect that MOOCs have wide appeal as a kind of Online University of the Third Age. I promise not to bore you with a blow-by-blow account of my toe-dipping experience with this course and style of learning but will report back to you later in the year when I have completed the course (or, perhaps, have dropped out, or perhaps have failed to pass!). One of the real strengths of the current Better Public Service Goals is that the target for 18 Year olds is expressed with some flexibility. To pin the target at “NCEA Level 2 or equivalent qualification” is both sensible and essential for a variety of reasons. It will be a very long time before all 18 year olds will be achieving this target through the conventional approaches of the secondary school. NCEA Level 2 does not function as an effective school leaving target for all simply because the secondary school-based pathway is not one that is attractive to or effective for all students. This is recognised in other school systems. In the United States the High School Diploma is the standard “school leaving qualification”. But many do not achieve this so an option is offered through the community college system in two ways. Study for other awards at the level of the diploma is recognised in the associate degree qualification or, where that study has been in general education subjects, often remediation courses, the qualification awarded is a General Education Diploma. This is “an equivalent qualification”. When a student has not found success in the pathway through a school the appropriate response will neither be in a school nor will the appropriate qualification be one that is seen as a “school” qualification. A multiple pathways response will see the foundation level study wrapped onto other postsecondary programmes and the student who finds renewed interest and energy in different pathways will subsequently be successful not because of the Better Public Service Goal but because they have a line of sight to other postsecondary qualifications and the employment that goes with them. Achieving the Level 2 goal will merely be a station their train passes through on that journey. Our education system has been dogged by two things in its history – the lack of connection between school and what comes after for a significant group of students and the fixation with a school-based qualification that has little connection with the qualification required beyond the gates. The Qualifications Framework was a mechanism that would allow equivalence to be struck between different programmes and qualifications. “Equivalence” is not “sameness” and judgment is required in striking equivalence between dissimilar programmes and qualifications at the same level. Trying to bundle everything at Level 1 or Level 2 into a package is at best pointless and might even be counterproductive. The Tertiary Education Commission insists only that programmes “offered through Youth Guarantee must be linked to level 1-3 qualifications on the New Zealand Qualifications Framework” and notes that “achieving level 2 qualifications should be the starting point for the learner, with tertiary education organisations encouraging and supporting Youth Guarantee learners to progress to higher levels of education” (see www.tec.govt.nz). This reinforces the principles of difference and equivalence. It also importantly reflects the importance of the Minister’s recent announcement that Youth Guarantee would apply to 19 year olds allowing level 3 programmes to become a realistic goal within a Youth Guarantee supported pathway. Level 3 is important in that at that level entry into other industry-recognised qualifications becomes more realistic and suggests that level 2 is an important stage – essential but not sufficient for a secure future. And that is an important point. Current moves to wrap foundation education into continuous pathways that take young people to a higher and better place are to be welcomed but if they result in re-introducing the disconnection between foundation work and the real qualifications they follow then many of the gains made by Youth Guarantee might be lost and that would be a great pity. If issues such as disengagement, NEETs, teen Mums and Dads, Maori and Pasifika achievement and so on are to be seriously addressed then level 1 and 2 must not become programmes based on new turf in its own right but a level of learning that is a genuine foundation on which the superstructure of higher skills can be placed. The two parts of this process are one and indivisible. Effective delivery of levels 1 and 2 in a seamless and connected manner will be a key to success not only of programmes but also for learners – both those things are also the same thing!